MRVPD works with community groups, non-profits, and government agencies to “provide access to safe, affordable and energy efficient housing for current and prospective residents” (MRV Vision Statement). We engage in efforts to analyze housing assets and needs, while providing planning assistance and resources to achieve community goals. In 2017, the MRVPD updated the 2006 MRV Housing Study, which has been used to guide housing development strategy in the Valley. See an overview of the 2017 MRV Housing Study here. This study provides an understanding of our current housing situation and needs, while guiding a multifaceted approach to increase affordable housing to support future economic growth and ensure long-term viability in the Mad River Valley. A partner organization of the MRVPD, the Mad River Valley Housing Coalition (MRVHC), employs this data and works to guide and aid community-driven housing initiatives in the Valley. Learn more about the MRVHC here. 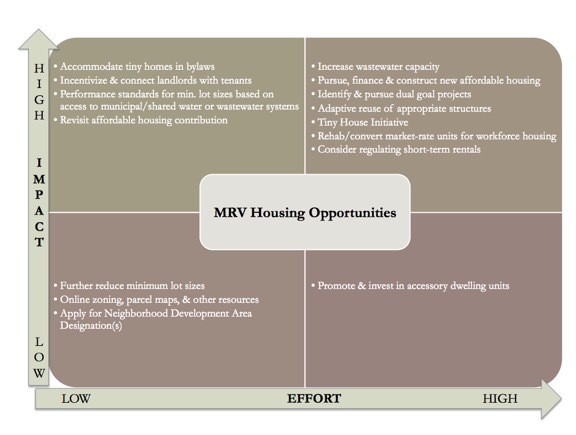 affordable housing in the MRV through a needs assessment, summary of types of housing needed & options, barriers to creation, and strategies to creation. The three towns of Waitsfield, Warren, and Fayston share many of the same housing challenges including seasonality, abundance of second-homes, poor quality housing stock built between 1960-1979, and a lack of wastewater capacity to support housing development in appropriate locations. Affordable housing is key to retaining and attracting young people, as well as maintaining a strong workforce, but rising housing costs have been outpacing increases in median household income between 2000 and 2014. *Affordable housing is defined as paying no more than 30% of one’s income for housing (Housing & Urban Development (HUD), 2018). The MRV will need to accommodate 459 additional households over the next decade to meet population projections (14-19% increase by 2030). Households are getting smaller, the population is getting older, and single & non-family households are on the rise – creating a need for additional small housing units. A person must earn $22.22 an hour to afford a 1-bedroom apartment in the MRV (as of 2017). A minimum wage earner must work 93 hours a week to afford a 1-bedroom apartment in the MRV (as of 2017). Purchasing a single-family home is out of reach for all but those households that earn above 120% of area median income. There was a 55% decrease in the number of people <35 years old who owned homes between 2000 and 2014, signaling a need for affordable ownership opportunities to attract and retain young people & encourage first time home buyers. 50% of business owners agreed that a lack of housing choices in the Mad River Valley is having a negative effect on the success of their business. 60% said a lack of housing choices has specifically affected their ability to attract and hire employees. 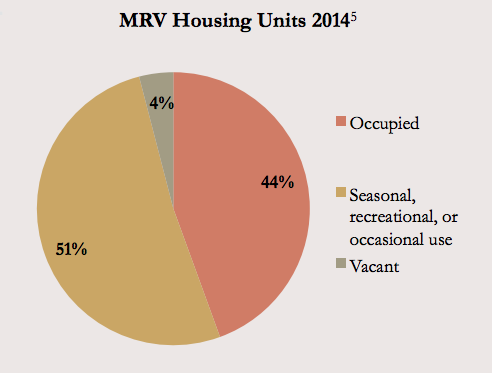 The greatest need for rental opportunities in the MRV are for households earning ≤80% of median income. 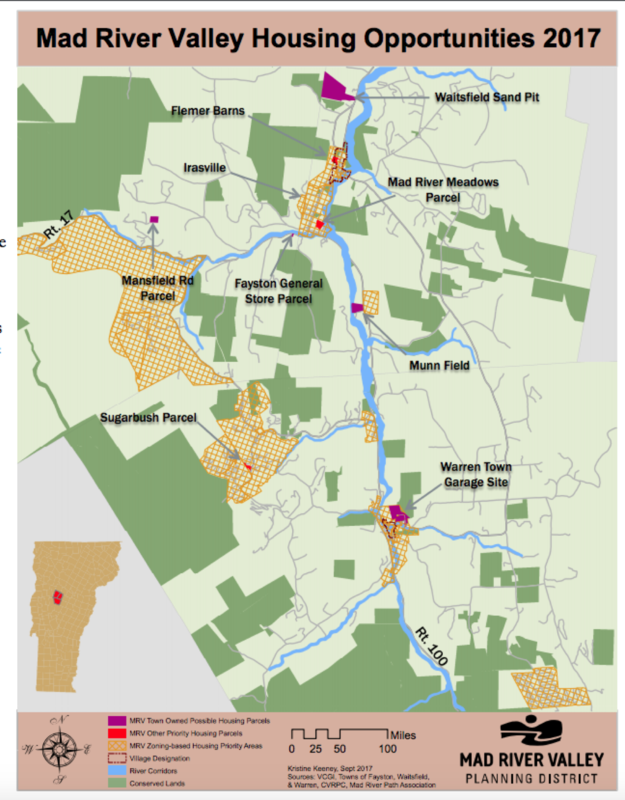 One of the Study’s recommendations has already been implemented through a partnership between the MRVPD and Sugarbush Resort to establish the Tenants for Turns program. Tenants for Turns is the first East Coast program of its kind and offers local homeowners incentives to rent to Sugarbush employees. **Note. The 2018 Washington County median income for all households is $58,171, $28,095 for a single person household, $70,458 for a two-person household, $80,490 for a three-person household, and $89,333 for a four-person household. (Source: Housingdata.org).